Even with a Super Bowl to is name, Joe Flacco is still not one of the hobby's elite quarterbacks. Still, he's on the right track and he now has the attention of collectors. Should he continue to impress in Baltimore, Joe Flacco rookie cards should show a steady climb in the months and years ahead. Shop for Joe Flacco rookie cards on eBay. And that's not a bad thing. Often when players skyrocket, they quickly plateau and it's all downhill, no matter what they achieve. But a steady climb spreads that growth out over time. Expectations stay in check and collectors are able to build solid collections without getting priced out of the market. There are a lot of Joe Flacco rookie cards for collectors to choose from. Because prices cover such a wide spectrum, here's a list of five awesome affordable cards and five high-end options featuring some of the most valuable Joe Flacco rookie cards. More than any other sport, football rookie cards are filled with jersey swatches. Every year, the Rookie Premiere gives card makers the perfect opportunity to collect plenty of player-worn gear to spread across the upcoming year's sets. As a result, plain jersey cards have taken a hit in recent years. Still, there's something to be said about a massive swatch. 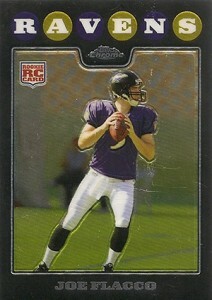 The 2008 Leaf Certified Materials Joe Flacco rookie card proves that. Not only is the swatch big, but it comes numbered to a reasonable 599. Yet, the card remains a little under $25. But for how much longer? The 2008 Topps design is certainly distinct. It works a lot more with the chromium spin that Topps Chrome offers. 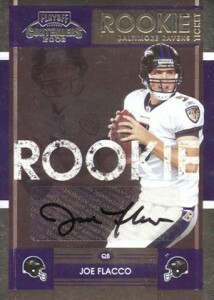 The greatest strength of the 2008 Topps Chrome Joe Flacco rookie is the brand's recognition. While huge sums are paid for the parallels and autographs, the base version remains a very affordable and attractive option. With numbering to a moderate 699 and a Refractor finish, the 2008 Topps Finest Joe Flacco shines -- literally. The design is on the busy side, but the colorful rainbow finish makes up for it. If that wasn't enough, the relatively low price tag might seal the deal for collectors sitting on the fence. 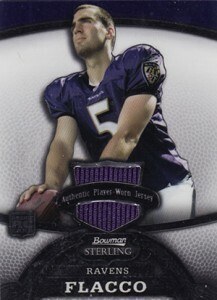 It might not have the massive swatch that 2008 Leaf Certified Materials has, but the 2008 Bowman Sterling Joe Flacco rookie still comes with a jersey swatch at a reasonable price. It's also got a nice high-end feel and a numbered print run of 569. The trifecta of clean design, relic piece and low numbering make this one an excellent choice for those on a budget. 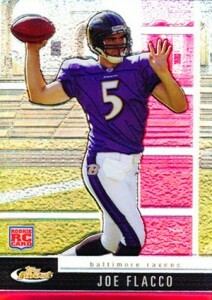 The 2008 Upper Deck Joe Flacco rookie card isn't so much about value as it is tradition and an attractive look. Pictured in the tunnel without his helmet, it's a nice portrait that captures a young quarterback ready to step into the spotlight with calm confidence. Since its debut, Upper Deck Exquisite has been the benchmark for ultra high-end rookie cards. 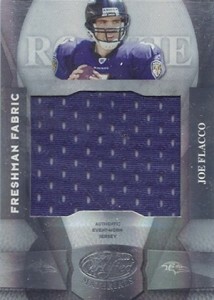 Numbered to 99, the 2008 Upper Deck Exquisite Collection Joe Flacco rookie card has an extremely elegant design. It's highlighted by a large patch swatch displayed in an attractive window and an on-card autograph. Despite all these elements, the design achieves a nice balance and doesn't look cluttered. Featuring many of the same elements as Upper Deck Exquisite, the 2008 Playoff National Treasures Joe Flacco also has an on-card signature, large patch piece and numbering to 99. It doesn't sell for quite as much as the Exquisite card, but National Treasures stills draws plenty of attention on the secondary market. 2008 SP Authentic bucks the trend of ultra-low numbering for high-end rookie cards. 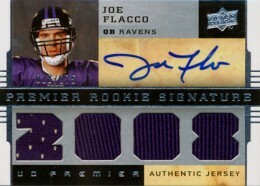 With a print run of 999, it's one of the more plentiful autographed Joe Flacco rookie cards. It's also one of the most attractive and widely traded. Hard-signed, it also comes with a patch piece. The swatch is smaller than National Treasures and Exquisite, but it's nonetheless a beautiful card. The Contenders brand has a strong following in the hobby. Although most years have on-card autographs, 2008 Playoff Contenders did not. 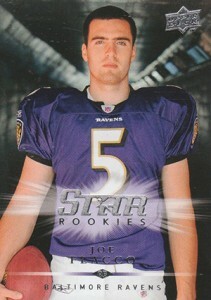 Even still, it is one of the top Joe Flacco rookie cards. Not numbered, the card has a print run of just 220 copies. Even with a quad jersey display and an autograph, the 2008 Upper Deck Premier Joe Flacco rookie card still has a clean look that doesn't feel at all cluttered. And while the signature is on a sticker, it's clear and blends in nicely. The card comes numbered to 275. 2008 Joe Flacco Topps Chrome Copper Refractor Rc SP 273 245! 2008 JOE FLACCO RC. PLAYOFF PRESTIGE DRAFT PICKS RIGHTS AUTOGRAPHS BGS 9.5 GEM.